Endophytic microbes colonize plants growing in diverse habitats and play important roles in modulating development and improving fitness of host plants. Endophytes may be major components of undiscovered microbial diversity. 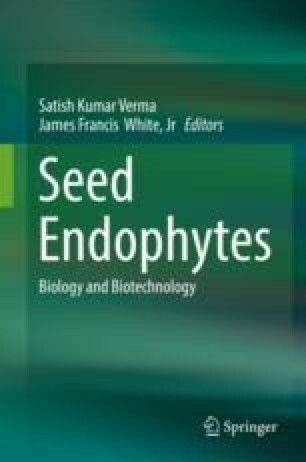 Further, endophytes may have applications in growth promotion of crop plants and protectors of plants from biotic and abiotic stresses. Endophytes have been a source of bioactive molecules of pharmaceutical importance. Major focus areas in the investigation of endophytes include (1) assessment of endophyte diversity, (2) determining the roles played by endophytes in modulation of host plant development and (3) assessing the biotechnological potentials of endophytes. The study of endophytes is particularly challenging because endophytic microbes often go unobserved in plants, many endophytes cannot be isolated, and plants free of endophytes sometimes cannot be obtained, making it difficult to conduct experiments. In this chapter we discuss some of the methodologies that are being used to overcome challenges to the study of endophytic microbes. The authors are thankful to the Department of Plant Biology, Rutgers University, NJ, for providing the facilities. SKV acknowledges UGC, India, for providing a Raman Post Doctoral fellowship No. F 5-11/2016(IC) for the year (2016–2017) to work in the USA. The SKV and RNK are also grateful to the Head and Coordinator CAS and DST-FIST and PURSE of Botany, BHU, Varanasi, for providing the facilities and leave to pursue endophyte research. SKV acknowledges the support from UGC (Project – UGC-BSR startup-M14-26). The authors are also grateful for the support from the John E. and Christina C. Craighead Foundation, USDA-NIFA Multistate Project W3147 and the New Jersey Agricultural Experiment Station.